Amidst disappointing news from the University of Virginia this week, I received an unexpected pleasure in the mail today: a 1938 University song book meant for football games and boxing matches. As with the 1911 song book I posted about a few years ago, this one contains the lyrics (but no music) to commonly known songs for the student body to sing at sporting events. Unlike the previous edition, 27 years later the repertoire had shrunk to just four songs: “Virginia, Hail, All Hail,” “The Cavalier Song,” “Hike, Virginia” (with the Carolina lyrics), and of course “The Good Old Song”–first and second verse. The advertisers list had shrunk too. 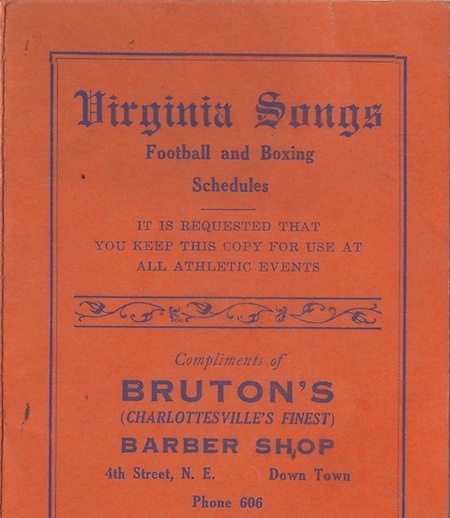 The sponsoring businesses were just two: Bruton’s Barber Shop (Charlottesville’s Finest!) and Valley View Greenhouses, both near what is now the Downtown Mall. For me, as with the previous version, it makes me happy to think about generations past of UVa students singing these song at sporting events. The full photo set is on Flickr: enjoy!